I am delighted to cross another item off my wishlist – a cobalt blue skirt. Thanks to the sweetest Jean for picking up an extra one for me while ordering hers during the Ann Taylor’s sale a few weeks ago. Despite the fact that it was just a tad big on her, it fits me perfectly throughout. I am so in love with this color. Even the husband said so. I don’t have anything like this in my closet so I am super excited for this addition. Even though this was a mini skirt, I still think the length is totally appropriate for work when paired with black tights. Since the mini-skirt is short and shows off your legs, you would want to keep your top half pretty covered. I paired this skirt with a sweater vest for a much casual look. A pair of booties completes this mini-casual look. This skirt is also a good candidate for achieving a chic color-block look. I can see myself pairing this skirt with a tank top and a black blazer for a dressier look. The possibilities are endless! That looks great on you Sydney! I love how you styled it, very unexpected with the cozy sweater vest on top! Have a great weekend! I know this post is about the skirt, but I really love your vest. I've been looking for a sweater with a similar print... but it's tough to find a print of this kind that it isn't too Christmas-y. Well done! Love the whole outfit! I love your low boots! I've been eyeing that skirt ever since it hit the AT website, waiting for a good sale to snag it up! I love the way you've styled it - it really shows its versatility, in the sense that it can be worn casually during the day, or business casual, or even at night with some colorblocking accessories! Sydney I really love this look! I love that vest, and may have to see if my local f21 has one. I am also admiring your lil booties too! Love how youve paired it with the vest! The skirt looks gorgeous on you! I love how you styled it here with the vest for a completely work-appropriate look. :) I only own a few cobalt blue items but I love them to pieces! Gorgeous styling! Love the fair isle vest with it! My local AT had such slim pickings of the new arrivals last week! I know the story only carries one size for oop or xxsp in each item, but there was hardly anything to choose from, including this skirt! Very pretty. Love this skirt on both of you. the skirt looks stunning on you, Sydney!! 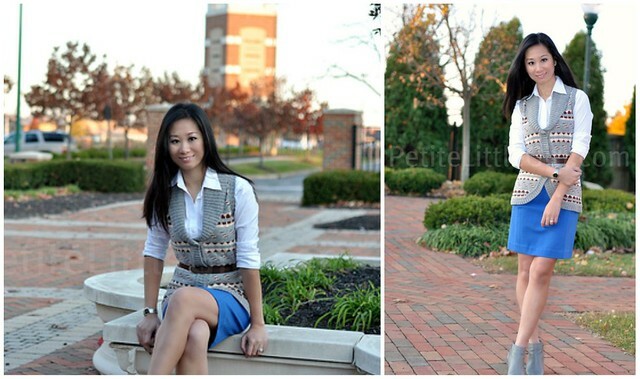 i love how you styled it with this sweater vest! LOVE LOVE LOVE it! especially with the sweater vest. Now to add two more things to my shopping list for fall. :) Thanks for the review and inspiration! Cute skirt...a cobalt blue one is a must have...and great idea pairing it with that sweater...thanks for the inspiration! I almost bought that same sweater vest last weekend, it looks fabulous on you!! yes! such a fun and versatile item to own :) loving your blog! Ive been looking for a plain blue skirt! Love the outfit!